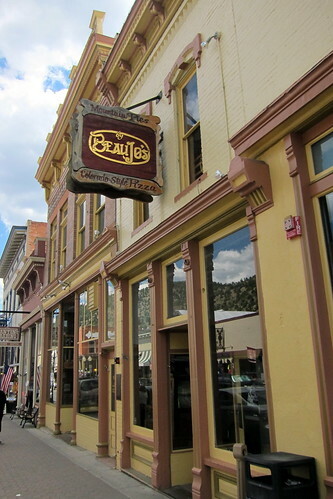 Beau Jo’s Pizza, at 1517 Miner Street in downtown Idaho Springs, was first opened by Chip Bair in the Miner Exchange Building 1973. What started out of a tiny, 18-seat store has expanded to seat nearly 600 in a small town with a population of 1,800, and included seven other locations in Colorado and one in South Dakota. Beau Jo’s legendary Colorado-style Mountain Pies is served by the pound, not by the inch. The High Altitude pizza features thick hand-rolled edges and is topped high with fresh toppings. Pies are offered in honey whole wheat grain or standard honey white crust, and each table includes a squeeze bottle of honey for crust dipping purposes. Beau Jo’s Pizza was featured on The Travel Channel’s Man vs. Food. The Miner Exchange building, at 1517-1523 Miner Street, was built in 1879 and originally contained J.J. Elliott’s assay office. During the boom days of the 1880’s, dozens of ore wagons could always be seen parked in front of the "Exchange." Elliott was also the president and manager of the Idaho Springs Electric Company, which was organized in 1887 and opened an arc and incandescent electric plant. Elliott had the difficult task of convincing citizens of Idaho Springs that electricity was safe and more than just a passing fad. The Idaho Springs Downtown Commercial District, roughly bound by Center Alley, 14th Avenue, Riverside Drive, and Idaho Street, has been the commercial center of the community since its development in the late 19th century. The Idaho Springs downtown area, with its collection of Late Victorian-Era structures, formed the core of a city where prospector George A. Jackson made the first placer gold discovery in Colorado. It went on to serve as an important milling and supply center for the mining region which accelerated the settlement of Colorado. This entry was posted in Colorado and tagged Beau, Colorado, Idaho, Jo's, pizza, Springs. Bookmark the permalink.